The Gay Gamer: Happy Halloween! I don't know about you, but I'm going to honor this holiday by playing a few horrific (or at least slightly spooky) video games. 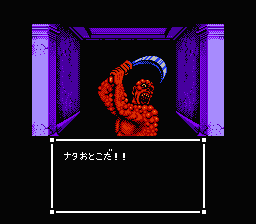 Specifically, I'm going to spend some time playing a couple of old Famicom games--Namco's Splatterhouse: Wanpaku Graffiti and Capcom's Sweet Home (below). If I had them, I'd probably play a bit of the first Fatal Frame, Resident Evil, Silent Hill and Siren titles, too. Which games do you like to pull out this time of year? Hi Again Just Dropped by Great Blog!!! No need to be sorry -- I wasn't going to make fun of you for getting a few games/words wrong! RE4 is super stressful, and I only finished it so I could be DONE with it. The second scene, where you wander into that town full of zombies...yikes. I was definitely beaten by that about 20 times before FINALLY getting through...but it was SUCH an adrenaline rush trying that I didn't give up. Oh, I've watched lots of videos of RE4 (yes, I'm that kind of nerd) and I *know* I couldn't play it. It's not because it's scary but because it's STRESSFUL! Plus, I've just never been able to wrap my head/hands around those RE controls. Anyway, hats off to you for beating it! Kuon is hands down the most scary horror game I know of. I don't get scared that easily, but that thing makes me want to pee my pants. I agree with you there, Bryan Ochalla. I hate the "tank" controls that RE is known for. Luckily later in the series they fixed that little problem. Too bad by then the game has turned too foreign from what I loved about the series in the first place. All of them have tank controls except the Outbreaks, Resident Evil 4, and Resident Evil 5. And yes, you should buy Kuon, it's the only game where running around and making sound will get you killed. You should also get into the Clock Tower games if you want a real adrenaline rush. Yeah, it takes a while, but you will get use to it. If you don't want to deal with it, you can just play the Umbrella Chronicles. It pretty much covers all aspects of the game.